A1. How to register on m4marry.com? Registering on m4marry.com is simple & completely free. The profile can be created by the person intended to get married, his/her parents, relatives or friends for him. Any person of legal age who intends to find a life partner can register. Registration can be done using the m4marry website, mobile (Android/iOS) or tablet. Start by entering basic details of the bride/groom-to-be, following which there will be a mandatory mobile verification. Once the mobile number is successfully verified, fill in the rest of your profile to complete the registration process. A profile ID will be generated automatically. A2. What are the Benefits of having a complete profile? The registration forms on m4marry.com are designed to include all important information about the person intending to get married which can be of interest to a prospective partner. Members can know more about you before they initiate contact. You can update your profile as and when you have time. Complete the registration very fast by keying in just the mandatory fields, marked by an asterisk. A3. Can I use the same mobile number & Email Id for multiple registrations? No. Mobile number & email address is unique for every profile & hence cannot be used to create/ update another profile. This is to provide enhanced security from fake users. A4. Will my Email Id and mobile number be accessible to everyone? No. The Email Id that you specify is the one to which M4Marry will send you all communication from prospective partners. The contact details that you provide will be shared only with subscribers to the site who are interested in your profile as a prospective partner. This will help to speed up contact especially for members who do not use online as a primary medium for communication. A5. How do I add more info than what is required in the registration form? We suggest that you add such specific information in the About Myself column. This field is designed to showcase who you are. But if you find for example that the caste that you belong to is not listed on the form, you can use the 'Others' feature. If you think that the category is critical to be listed, please mail us on support@m4marry.com. We shall respond to you on whether we can include the same. B1. What do I enter in the field About Me? ‘About Me’ is where you can enter a description of yourself. Most members who view your profile get a picture of you based on what you enter here. Mention the kind of person you are, your job profile, interests and so on. All content in this space will be screened for objectionable matter. Please do not enter contact details in this space to avoid the entries being rejected. B2. What do I enter in the field about my family? The ‘About my Family’ field helps you write about your family members, values that your family upholds etc. All content in this space will be screened for objectionable matter. Please do not enter contact details in this space to avoid the entries being rejected. B3. How do I add photos on the site? Any registered user can upload up to 9 profile photos and 3 family photos with their profile. You can add your photos at the time of registration. The family photos can only be seen by the paid members. Alternatively, you can add photos from ‘Manage Photos’ section in My Account page. Profiles with photos generate more interest and increase your chances of getting contacted. B4. Can I change the photos that I have uploaded? Yes. You can change your photos using ‘Manage Photos’ in Edit My Profile page. B5. How do I upload Horoscope in my profile? You can add your horoscope using ‘Horoscope: Add/Modify‘ in Edit My Profile page. Note: The horoscope can only be viewed by paid members. B6. What are the formats in which I should upload my attachments? For photos, you can upload files up to 2 MB, in either of these formats: jpg, png or bmp. For Horoscope, you can upload files up to 2 MB, in either of these formats: jpg, png, bmp, doc, pdf. B7. What are the attachments that I can include in my Profile? B8. Why do I need to add a partner preference in my registration? Your partner preferences will give members an idea whether they match with your expectations. More importantly, your periodical match watch alerts and new match alerts are built on the information provided in your partner profile. While creating your partner profile, please ensure that you do not input too many parameters; chances are you may not obtain optimum results. For eg. : if you define desirable height range as 160 to 165, you could miss out on a lot of matching profiles. B9. How can I change the information I submitted at registration? You can change information added at registration by clicking ‘Edit my Profile’ on your My Account Page. B10. What are Trust Badges? Trust badges add credibility to members. Add trust badges to ensure more responses. You can upload the documents in Edit My Profile page. Please upload a copy of your Identity proof to enable Identity Badge. Upload any one of the Identity proof such as Aadhaar card, Driving License, Passport, PAN Card, Passbook of any Nationalized Bank, Photo Identity Card issued by Central/State Govt/PSU, Voters ID card. The uploaded Identity proof will only be visible to the m4marry team. Only JPG, PNG, BMP formats are allowed and maximum file size up to 2 MB. Enter your Facebook or LinkedIn User ID to activate the badge. After activating, the member shall be able to view mutual acquaintances on Facebook/LinkedIn if available. The mutual acquaintances can only be viewed by the paid members. Update your reference field in the reference section. ‘Add references to get more responses, your prospects might know them’. The reference details can only be viewed by the paid members. If the contact details have been updated and verified, the contact badge shall be displayed on the profile with the verified stamp. The contact details can only be viewed by the paid members. B11. Why are some of my profile details entered marked in red? All content that you have entered is manually screened & validated for objectionable matter. The fields are not shown & marked in red till they are approved by the m4marry admin. The approval is very fast, and you need to be patient for a maximum of 24 hours before they are approved and displayed. B12. Why can't I view my attachments immediately? C1. How do I Login? You can log on to m4marry.com with your registered username and password. C2. What is Profile ID? ‘Profile ID’ is a unique number that is attached to your profile. This number will be displayed on your profile whenever it is viewed. The ID can be entered in the search option - Search profile by ID, to find the profile you are looking for. C3. Can I change my mobile number & Email ID after registering? After registering, you can only change your mobile number. The email once entered cannot be changed. Please contact m4marry support or mail to support@m4marry.com to change your Email ID. C4. I forgot my Password, how do I reset? If you forget your password, resetting the Password is an easy process. Using ‘Forgot password’ link enter your m4marry registered Email Id or Profile ID or Username to receive an Email with the link to reset your password. C5. How do I Change my password? After logging into the site, there is an option called ‘Change Password’ to change your password. C6. How do I ‘Hide’ my profile? You can hide your profile from being viewed by other members using ‘Hide’ feature in Edit My Profile. By choosing the hide option, the hidden profile will not be able to communicate with other profiles and will not be listed in the search results. C7. How do I ‘Block’ Profile? You can choose to block members who send unwanted messages. There is an option to ‘Block’ the member inside each member’s Profile detail page. The blocked profile will no longer be a matching member or will not be able to communicate or view your profile details. C8. How does My Account page help me manage on m4marry.com? The ‘My Account’ is your personal dashboard of activity on m4marry.com.You can track your communication to and from members on this page. This page also helps you to view your subscription details, view various types of matches. C9. How do I Delete my profile? You can delete your profile using ‘Delete Profile’ feature in Edit My Profile page. Deleting your profile will completely remove your profile from the site. C10. How do I Logout? You can use the button on the top right-hand corner to log out of m4marry.com. It is important that you do so. The special privileges that you have can be misused by someone else if you do not log out. D1. How do I search for my partner on m4marry.com? You can search for your partner on m4marry.com using the simple search. You can also use the advanced search to broaden the search criteria. The search results can be further filtered by a number of parameters. D2. What are the other search options? This search is based on the details entered in your partner preference. This search is based on the search criteria such as Gender, Age, Religion, and Caste. This a detailed search wherein you can broaden the search criteria such as Gender, Age, Marital status, Height, Religion, Caste, Education & career details, Lifestyle, Family details, Hobbies & Interests. There is also an option to modify your search. Search can be done just by entering the m4marry Profile ID of the profile you would like to see. This search will be based on the profiles that are currently online and the search criteria such as Gender, Age, Marital Status, Religion, Education, Occupation and Country Living In. D3. Can I save my search? Yes. This is a free feature available to all registered users of m4marry. Based on the criteria that you have entered in the search, you can save the search. The user can save a maximum of 3 searches. D4. Is there any option to hide already viewed profiles from search results? Yes. In the search results page, there is an option don’t show Already Contacted /Already visited profiles. By selecting the above option, you can avoid from viewing the same profiles. E1. How do I upload Introduction Video? This is an exclusive free feature where all registered users can upload the introduction video (Max size of 100 MB) through the m4marry app. m4marry.com subscribed users have the special privilege to view the introduction video.You can only remove the introduction video through the mobile app. E2. What are Photo requests? E3. What is a Photo/Video Password request? Members can choose to protect their photo(s)/video with a password using ‘Change Photo Password’ in Edit My Profile page. You can choose to send other members a request for the Photo/Video password that they can either accept or reject. If the member accepts your request, you will receive a password with which you can view the photo(s)/Video. E4. What is a Horoscope request? Some members may not have added their horoscope.You can encourage them to upload horoscope or generate free m4marry horoscope using Horoscope request. E5. How do I set Filter? You can set filters using ‘Add Filters’ in My Account page. Setting too many filters may lower the response for your profile. You may choose this feature only if you are very sure that you want limited responses. E6. How can I see the profiles that I have marked as a Favourite? There is ‘My Favourites’ section in your My Account page. This gives you the list of all the profiles that you have marked as a Favourite. NOTE: ‘Members who favourited me’ gives you the list of all the profiles who has favourited you. E7. What is Match Watch Feature? The Match Watch service is a helpful and powerful tool from m4marry.com that brings you matching profiles based on new members who have registered with the site. It's a periodic mail that is sent to members. In order to receive Match Watch alerts your email address must be verified. E8. What is Match history? Match History chronicles all matching profiles that m4marry has identified as fitting in with your criteria. In order to receive match history, your email address must be verified. E9. Why am I getting match watch profiles which don't fit with my criteria? Please check the information that you have provided on your Partner preference. If this is too broad, then you may get a lot of response that does not specifically match your requirements. On the other hand, if you have defined it too narrow, you may miss out on prospective partners. Astromatch is a premium service offered by m4marry.com that members can subscribe. The Astromatch offers users the advantage of matching profiles online. Astromatch can be done on any two profiles for which horoscopes are generated on m4marry.com. Astro match cannot be done if any of the profiles do not have horoscopes or if any has an attached image file as a horoscope. Horoscopes can be generated for free. To use Astromatch, please subscribe to the service by using this link . E11. How do I match profiles with Astromatch? To use Astromatch, you need to subscribe to the service. After subscribing, you just have to enter the profile id of the profile with which you would like to check your Astro compatibility. The match report is generated immediately. E12. What is Astromatch history? Astromatch History contains the details of profiles you just have entered to check your Astro compatibility. To use Astromatch, you need to subscribe to the service. E13. What is an Email Blast? The members of subscription type Premium Plus and Active Plus have an exclusive feature to send their profile as an ‘Email blast’ to all Preferred matches. NOTE: The Email blast can only be sent once to the same member till the validity of the package. E14. How do I take Print out of a profile? This is an exclusive free feature for all registered users. When we select any profile, there is an option called ‘Print this Profile’ through which print out can be taken. NOTE: Only if you are paid member you will have access to take print out of the complete profile. E15. How do I know if other prospects have viewed my contact? You can keep track of who all viewed your contact details, using ’Viewed My Contact’ in your My Account page. E16. How do I know if I have already viewed the contact details of a profile? The ‘Contacted profiles’ in My Account page shows you the list of all the profiles whose contact details you have viewed. E17. How do I know if other prospects have viewed my profile? You can keep track of who all viewed your profile using ’Member(s) visited your profile’ in your My Account page. E18. How do I know if other prospects have viewed my Photo/Introduction video? E19. How do I add my success story? We are eager to know how m4marry helped you find your perfect match. If you want to share your success story with us, then click here . F1. How do I contact members on m4marry.com? To contact members on m4marry.com you need to be a registered user of the site. You can also send personalised messages /send SMS or initiate chat with a member or view the contact details of another profile only if you are a paid member. F2. What is Express Interest? This is a free communication feature on m4marry.com for all registered members. This feature allows you to let them know that you are interested in them. The member can accept or decline an interest based on their interests. You can send unlimited interests in a day. There is also an option to send an interest reminder after expressing interest. When you accept an interest, it implies that you are open to further communication. You can also choose to decline an interest if you are not interested in that member. Note: By declining interest, you will no longer be a matching member for this profile & likewise the other profile. F3. How do I track the Interests/ Messages sent to me or I have replied? The entire communication can be viewed on your My Account page. F4. Can I write personalised messages to any member? M4marry.com paid members has a special privilege of initiating personalised communication with other members.There is also an option to send message reminder. F5. How many SMS can be sent to a user? Subscribers to m4marry.com have the special privilege of using ‘SMS’. The user can send only one SMS per user. F6. Can members respond to me if they are not paid members of m4marry? All registered users can respond to personalised messages from subscribers, irrespective of whether they are registered members or paid members. F7. How do I Forward Profile? This is an exclusive free communication feature for all registered members. You can choose to forward a profile by just entering a valid Email Id to any person. You can choose to forward a profile by just entering a valid email address to any person (may not be a registered user of m4marry). F8. How do I know when a member contacts me? M4marry.com has a great tool to let members know when they have received an interest/message/request or a reply to interests/messages/requests sent to them. This is immediately intimated through an SMS or an Email. Please make sure that you verify your m4marry registered Contact number and Email ID. This information is also available on your My Account page. F9. Why is the chat window not opening when I log in? The chat window normally opens automatically when you log in. If it doesn't, please ensure that you have not activated the pop-up blocker on your browser. F10. Can I view my chat history? Yes. You can view your previous chats from the chat window. There is also an option to send your chat history through Email. G1. What is verified phone numbers? How do I verify my contact number? In order to proceed further on M4marry.com, verification is compulsory. Verification of your phone number can be done using any one of the 3 options available. They are One Time password (OTP)/ Interactive Voice Response (IVR) Verification / Missed Call process. Each process is explained in detail in the ‘Mobile verification’ tab. So, unless you verify your mobile number, you cannot use our service. You can edit your contact details in Edit my profile page. G2. Why should you verify the Phone number? Mobile Number Verification adds the credibility factor to your profile. You will receive SMS alerts only if you have verified your mobile number. So, verify your mobile number at the earliest because we make sure to cater only to authentic profiles. H1. What are the various types of memberships on m4marry.com? All members who have their profiles on m4marry.com are registered members of the site. A subscription to m4marry.com brings its own special privileges like access to communicate, view contact details and sending personalised messages, allows the member to view entire profile details & to receive complete matrimonial services that are a combination of online access, print advertising in the matrimonial page of the newspaper. H2. What are the subscriptions offered on m4marry.com? There are three packages currently offered to members on m4marry.com. Each package can be accessed for three different time frames - Three months, Six months and One year. The Premium package has access to all premium features such as access to contact information of members, ability to initiate a chat, send personal messages and SMS and a tag to differentiate your profile from other profiles. The Premium Plus package has access to all the Premium features as well as gives you the powerful advantage of featuring your profile as a Featured Profile to stand out from other profiles and share your profile with your preferred matches using Email Blast. 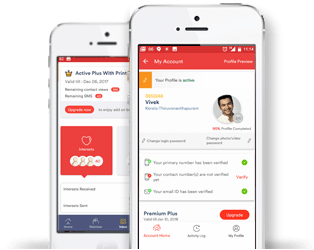 This package offers the subscription to Premium Plus features and offers special services to the user such as an Active plus Dashboard, a Dedicated Active Support Executive for Searching, Shortlisting and Contacting profiles based on your approval. Your Profile will be highlighted in the search results page. H3. What are the benefits of becoming paid member of m4marry? As a paid member, your profile will have a prominent display in the search results page. Your profile will be listed in the Premium Matches. Another feature exclusive to paid members is called Right Matches . It shows you an exact match based on your partner preference. As a paid member, you can initiate right match interest to matching profiles. As a paid member, you can initiate Message and SMS. You can view their Family details, Contact details, Educational and Career details, Photos, Self-Introductory videos, their Horoscopes, view the Facebook and LinkedIn acquaintances of potential matches & details of the references. With the Star Match feature, Hindu users can view a list of matching profiles based on compatibility of stars between partners. H4. What are the various Add-on packages offered on m4marry.com? The Astropack is an online horoscope matching feature that is very useful to members who prefer a horoscope match. Click here to subscribe. With our Profile Highlighter package, your profile will be highlighted on the search results page for 14 days whenever it matches the search criteria of the user. With our Prime package, your profile will appear as top listed profile on the search results page for 14 days whenever it matches the search criteria of the user. H5. How do I decide which membership is best for me? Compare the benefits of our different packages and choose one that fits you best using our Membership Comparison Chart. H6. Can I renew/upgrade memberships? You can renew your current membership only a couple of weeks before from the time of expiry of the current one. If you renew your membership during the renewal period, you can retain the contact information of already viewed members in your expired package. H7. Can I subscribe a new main package if I exhaust my limit of contact views of the current subscription? Yes. There is an option to purchase a new package even if your contact views of your current subscription has exhausted. Please contact our customer care if you face any subscription related issues. H8. Can I carry forward my contacts views/SMS of the expired package to the new subscription? No. There is no option to carry forward the remaining Contact views/SMS to the new subscription. The validity of the contact views/SMS is till the package expires. After the expiration of the package, you cannot carry forward. H9. How can I see my membership details? You can view your current Subscription details and your Subscription history using ’Membership Details’ in My Account page. H10. Can I buy Add-on packages, even if I have a current subscription? You can choose to buy Add-on packages alone. To purchase, click here . H11. What are the Payment Options available on M4Marry.com? You can choose to pay by cash at any of our offices. H12. Is my credit card payment on m4marry.com secure? Yes, your credit card information on m4marry.com is perfectly secure. Our encryption software prevents misuse of user information. The Encrypted information is passed to the payment gateway. Credit card details are entered only on the Verisign Certified secure server. 128 bit SSL encryption is deployed. We can process Visa and MasterCard credit cards issued around the globe. Real-time authorization happens to the information. For an extra level of protection, our payment gateway also supports 'Verified by VISA' and 'MasterCard Secure Code' services. H13. What is the Cash on Delivery Option? Cash on Delivery (COD) is one of the payment methods available on m4marry.com. It allows you to order membership online. Our collection associate will contact you and collect the payment based on your convenient date. There are no extra charges for Cash on Delivery. You can pay either by cash or by Credit/Debit card in selected locations. You can check with our collection associate if credit/debit card payments are available at your location. We accept Visa, MasterCard, Maestro and RuPay debit cards and selected credit cards. You may contact us at support@m4marry.com for any assistance. H14. Why is my membership not activated even after payment? We might not have received any response from the bank for your payment request due to technical reasons. As a result, we may not be able to know the status of your payment transaction and hence assumed it to be a failed payment. Kindly contact your respective bank to know about the transaction details. Please revert to us on support@m4marry.com if you have any queries. H15. How soon will my membership be processed when I make payment? Your membership will be activated as soon as the payment process is successfully completed. H16. What is the refund policy of m4marry.com? You can start enjoying all the benefits of a subscription immediately on making payment; hence payment once made is not refunded. I1. What happens if there is objectionable content in any of the matter I have entered? If by any chance any/all of the fields have objectionable content, the m4marry team rejects entries in the field and sends you an email showing the reason why it has been rejected. You can change the matter and enter the fresh content using the link in your Edit my profile page. The new entry will be screened and approved by the m4marry team. I2. How do I ensure that my profile is safeguarded on m4marry.com? M4marry.com protects the user's privacy at every stage. You can choose to provide as much or as little information on m4marry as you choose. You have options to set passwords for your photos, videos, and horoscopes. You can approve a request before the information is sent to other members. All image files are also watermarked to prevent misuse. This feature is available to all members regardless of whether they are free users of the site or subscribers. You can keep track of the users who has viewed your photos/Profile/Viewed your contact. I3. How do I report if I get unwanted messages from any members? You can choose to ignore members who send unwanted messages. You have the option to Ignore/block that member. You can also report abuse/obscene content sent by any member by forwarding the same to support@m4marry.com. We will look into the matter immediately. I4. What do I do if I see any objectionable content on the site? M4marry.com manually screens all text entries and images to ensure that objectionable matter does not appear on the site. Just in case it has slipped our notice, please send a mail with the problem to support@m4marry.com or use the Report a Problem feature at the bottom of all our pages. I5. How can I send in my suggestions for site improvement? M4marry.com is dedicated to creating the most comprehensive platform for Malayalee’s to meet online for matrimonial purposes. It is your suggestion and support that shall enable us to do so. Please mail your comments/suggestions to support@m4marry.com. We shall revert to you on the same. I6. How sure can I be of information entered in profiles on m4marry.com? M4marry.com does not offer a profile validation service currently. The user posts the information on the profiles and members are advised due diligence on all profiles before they proceed further. Please report any issues that you have in this regard on support@m4marry.com.